Hilo has been destroyed several times by tsunamis. 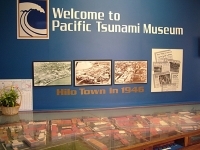 The first-hand oral testimony of tsunami survivors is now preserved along with some other fascinating information in the Pacific Tsunami Museum, located on Kamehameha Avenue in the town. The museum features a series of permanent exhibits that interpret the tsunami phenomena, the Pacific Tsunami Warning system, the history of tsunami in the Pacific Basin, tsunami of the future, myths and legends about tsunami and public safety measures for tsunami disasters. Opening times: Monday to Saturday 10am-4pm. Admission: $8 adults, $4 children 6-17. Other concessions available.